Mix the green tea powder with a bit of hot water to form a paste. 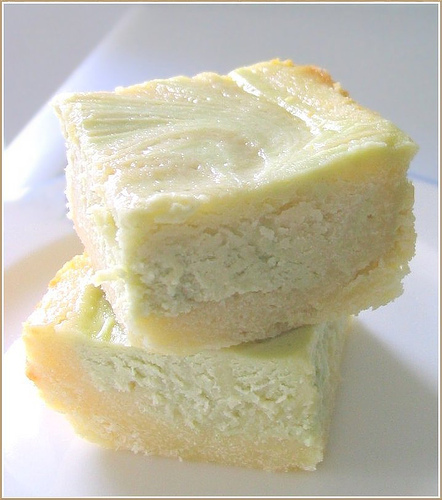 Mix the cream cheese, egg, and green tea paste until smooth. Taste a bit and see if it's strong enough. Melt the butter with the white chocolate. Mix in the sugar, eggs, vanilla, and flour (and baking powder if you want to experiment with it). Whisk until smooth but do not over mix. Line a 8 x 8 square baking dish with a sheet of foil (with overhang for easy lifting) or grease and flour it. Pour in half of the white chocolate batter. Then drop half of the cream cheese mixture on top in spoonfuls. Top the batter with the rest of the white chocolate brownie batter, then finally add the remaining half of the cream cheese mixture on top. Use a knife and swirl the brownie and cream cheese together to create a marbled pattern. Bake the brownies at 325ºF for 40 - 45 minutes, or until a toothpick inserted in the center comes out with moist crumbs. The center should be almost set. You don't want the toothpick to come out clean because that would mean the brownies have overbaked. Cool in the pan for 5 then lift the brownies out and cool to room temperature. They're best served cold so chill them in the fridge for about 3 hours.